Drones are getting Snappy Autopilot Apps. On Indiegogo you can contribute to the PixHawk Fire (PXF). 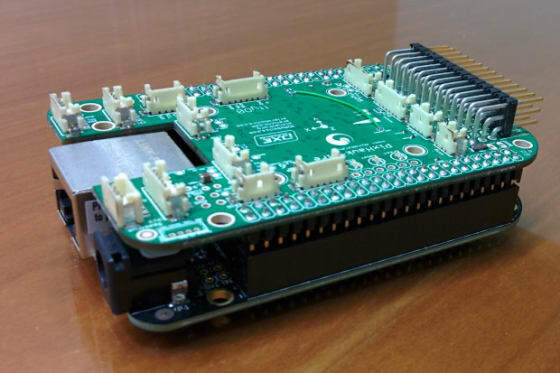 The PixHawk Fire (PXF) is an open hardware cape (daughter board) for the BeagleBone Black that allows you to create Snappy autopilot apps for drones. Behind the cape there is Erle Robotics, a startup based in Spain and led by a group of roboticists focused on bringing up the next generation of personal robots powered by Ubuntu Snappy Core. The first autopilot Snap is based on the open sourced APM autopilot. The autopilot Snap integrates with the Open Source Robotics Foundation framework, ROS, which by itself runs on Snappy Ubuntu Core. This modular software and hardware design allows robotics and drone developers to divide and conquer. Before you had to be an expert in plastics, metal, mechanical engineering, embedded boards, embedded operating systems, robot and drone software, etc. The new approach allows anybody to only focus on the subset they are a real expert in. Software designers will be able to create drone and robot Snaps. Board designers will be able to create more powerful, smaller and cheaper boards. Mechanical engineers and others can focus on bringing the products together into real robots and drones. Everybody can work on their speciality at their own speed without being slowed down by the rest.